↑ 1.0 1.1 "Austria". The World Factbook. Central Intelligence Agency. 14 May 2009. https://web.archive.org/web/20090610113837/https://www.cia.gov/library/publications/the-world-factbook/geos/AU.html. Retrieved on 31 May 2009. ↑ "Die Bevölkerung nach Umgangssprache, Staatsangehörigkeit und Geburtsland" (PDF). Statistik Austria. https://web.archive.org/web/20101113171636/http://www.statistik.at/web_de/static/bevoelkerung_2001_nach_umgangssprache_staatsangehoerigkeit_und_geburtsland_022896.pdf. Retrieved on 17 November 2010. ↑ "Austria". Encyclopædia Britannica. 31 May 2009. https://web.archive.org/web/20090419153631/http://www.britannica.com/EBchecked/topic/44183/Austria. Retrieved on 31 May 2009. 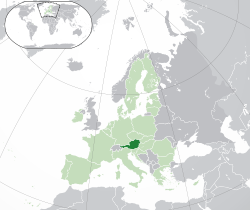 ↑ "Austria joins Schengen". Migration News. May 1995. http://migration.ucdavis.edu/mn/more.php?id=643_0_4_0. Retrieved on 30 May 2009.